Michael Vanim has been coaching since 1991. He has coached many gymnasts from Parent-Tot's classes to National Champions. Mike graduated from Ursinus College where he was an assistant coach for the 1990-91, and 1991-92 seasons. Mike has also made over 200 skydives, and believes it is something everyone should try. His favorite book is Jonathan Livingston Seagull, Harry Potter comes in a close second. Mike has been a level 8 judge. He is also a retired Drill Sergeant in the U.S. Army Reserve. 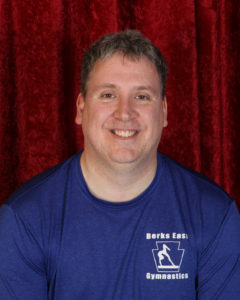 Dan joined the Berks East Staff in 2005. He attended Penn State university before starting a commercial cleaning business in 1990. He was a recreational gymnast and understands how the confidence built by gymnastics translates to everyday life. He has one daughter that is a member of the Berks East Gymnastics Team. 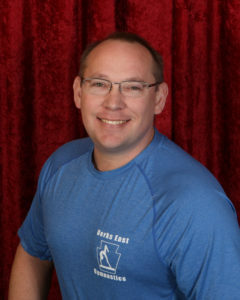 (One is doing gymnastics at Ursinus College) Dan enjoys helping kids challenge themselves while keeping it fun! She started gymnastics at age 7 and has coached since age 15. She is from Rock Hill South Carolina. She enjoys running, reading, babysitting, enjoying the outdoors, playing with her pet bunny and playing and watching sports. She is now a proud mom of her daughter Ally. Eileen graduated with a BS in Health and Physical Education from West Chester University. She has taught in both public and private schools, but her true love has been to teach and coach the sport of gymnastics. Her favorite events are bars and beam. She also enjoys training the girls in the mental aspects of the sport. Over the years Eileen has had eight gymnasts qualify to attend the TOP National Camps. She finds training young gymnasts in the developmental areas of strength, flexibility and conditioning to prepare them for future competition very rewarding. 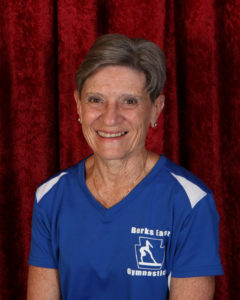 Cindy began coaching gymnastics in 2000. Sue graduated from Penn State University as a Certified Occupational Therapy Assistant with CPR/First Aid training. She has been coaching gymnastics since 1992 having coached Pre-school up to Level 10, and is USAG safety certified. She has coached many State, Regional and National champions from Level 5 through Level 10. Sue’s favorite events are beam and floor, and she has coached several State beam and floor champions. She believes that a key part to success in gymnastics relies heavily on mentalpreparation, hard work, and belief in oneself. Sue is married with two grown children and a grand-dog. Her favorite activities are spending time with family, walking or riding bikes with her husband, and taking unplanned road trips to various places. Sarah was level 10 gymnast at Berks East Gymnastics, graduated from The Ohio State University in 2015 and was the Assistant Coach at the University of New Hampshire for the 2015-16 season. As a Buckeye she set the record for most 9.9+ scores, becoming the most decorated gymnast in Ohio State History. She is also a 3-time NCAA All-American, Big Ten Balance Beam Champion, NCAA Regional Beam Champion, 4-time First Team All-Big Ten Selection, 2011 Big Ten Freshman of The Year, and won 12 Big Ten Gymnast of the Week or Freshman of The Week Honors during her career. While her time a UNH she helped aid the 2016 EAGL Freshman of The Year as well as a 2nd ranked Balance Beam team for four straight weeks during the 2016 NCAA season. She has been coaching gymnastics for 11 years in the state of OH, PA, and NH. She has also worked with the USAGym staff on numerous occasions. 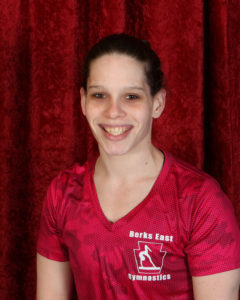 At age 3, Donelle started her gymnastics career at Perry Juniata gymnastics in central PA. She began competing at 6 and continued to compete through level 8 while achieving numerous state medals for vault and floor. She then continued on to West Chester University where she obtained a BS degree in Communication and Health Science. In her spare time she enjoys staying active with her 3 kids and husband! Coach Jenny started competing in gymnastics at the age of 7. She spent the majority of her optional career at Gym Dandys in Washington, PA. As a senior she graduated as a Level 9 gymnast placing 2nd on vault at Nationals. She went on to compete at Ursinus College where her team placed 2nd at Nationals her sophomore year. She has an extensive background in teaching ESL and has traveled all over the world. She has been coaching gymnastics, on and off for over 15 years (kids of all age levels and abilities). Dee has enjoyed coaching gymnastics since 2015. She is a former Berks East gymnast and competitive cheerleader. She was a state champion in floor exercise who competed through level 8. Susan was a gymnast at a young age. She has been a coach for past 7 years (coaching track/field and gymnastics) She has a master's in Secondary Counseling Education and currently a high school guidance counselor. She has worked with children for over 2 decades in field, camp, and school settings. Alison Fischer has been coaching for over 14 years. Alison joined Berks East in 2014. She enjoys coaching the Xcel and the JO gymnasts. Alison was a regional elite gymnast for Will-Moor in New Jersey. She earned a full athletic scholarship to Temple University. She graduated in 1993 with a BS in Health Education. Alison is currently a Level 10 Gymnastics Judge (NAWGJ). She is married and has two children who play a lot of soccer. In her spare time, Alison enjoys riding her bike and taking long walks. Delaney feels that she has been lucky enough to work at Berks East Gymnastics for over a year and a half now! Before my involvement in coaching gymnastics, I was a proud gymnast of Berks East for eight years. Now, I use that knowledge to coach classes from Tumble Bear Tots to Advanced. Jenn came to Berks East in 2014 and has worked with our Xcel Team and our Acro & Tumbling Team. Jenn has an extensive background in education, cheer, dance, and gymnastics. Jenn is also an English-Language Arts teacher in the Muhlenberg School District. Jenn was the head coach of Alvernia University’s cheer team where she earned her M.S. Education. She also graduated from Kutztown University in 1999 with a B.S. Education where she was also a member of their nationally ranked cheer team. Jenn strives to instill in the athletes she works with the value of overcoming obstacles and growing both as an athlete and an individual. Jenn is married and has two children. Her daughter is a member of the Berks East Gymnastics Team and her son plays soccer for Wyomissing. Additionally, Jenn and her husband are involved with Reading United A.C., the minor league affiliate of the Philadelphia Union.